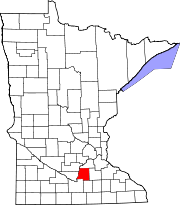 Le Sueur County is a county in the U.S. state of Minnesota. As of the 2010 United States Census, the population was 27,703. Its county seat is Le Center. Le Sueur County is part of the Minneapolis-St. Paul-Bloomington, MN-WI Metropolitan Statistical Area. The Minnesota Territory legislature established several counties in 1853. This county was created on March 5 of that year. It was named for French explorer Pierre-Charles Le Sueur, who visited the area in 1700. The settlement of Le Sueur (actually two competing settlements, Le Sueur and Le Sueur City) had sprung up on the east bank of the Minnesota River, both being platted in 1852. The combined area was named by the legislature as the first county seat. However, its remoteness from most of the county meant hardship for most of the area's residents since the county was covered with dense hardwood forest and existing roads were impassable when wet. Several efforts were made to acquire a more central location. In the early 1870s, Cleveland (which had been established in 1857, inland from the river in the SW part of the county) held a referendum to become the county seat. The referendum passed, but was challenged due to irregularities in the voting. In 1875 another referendum was successful, and Cleveland became the county seat (1875-1876). In 1876 another referendum approved moving the seat to the newly-created town of Le Sueur Center; the seat was promptly moved there. In the 1870s, businessmen from Waterville gained ownership of a quarter-section of land near the county's center, cleared the timber, and platted the city of Le Sueur Center (1876). The seat was moved there, after a county referendum approved the move. The county seat has remained in Le Sueur Center (renamed Le Center in 1930) since 1876. The first railroad entered the county in 1867. This began the era of greater access and mobility. The first purpose-built courthouse in Le Sueur Center was constructed in 1896-7. It has been extensively remodeled and enlarged two times since then. The Minnesota River flows northeastward along the west border of Le Sueur County, on its way to discharge into the Mississippi. The terrain consists of low rolling hills, dotted with lakes and ponds. The soil is rich and black. The terrain slopes to the north and east, with its highest point near the midpoint of its east border, at 1,145' (349m) ASL. The county has an area of 474 square miles (1,230 km2), of which 449 square miles (1,160 km2) is land and 25 square miles (65 km2) (5.3%) is water. Le Sueur is one of seven Minnesota savanna region counties where no forest soils exist and one of 17 counties where savanna soils dominate. As of the 2000 United States Census, there were 25,426 people, 9,630 households, and 6,923 families in the county. The population density was 56.6/sqmi (21.9/km²). There were 10,858 housing units at an average density of 24.2/sqmi (9.34/km²). The racial makeup of the county was 96.56% White, 0.15% Black or African American, 0.26% Native American, 0.30% Asian, 0.04% Pacific Islander, 2.02% from other races, and 0.67% from two or more races. 3.92% of the population were Hispanic or Latino of any race. 44.9% were of German, 9.0% Czech, 9.0% Norwegian and 8.2% Irish ancestry. 94.0% spoke English, 3.5% Spanish and 1.7% Czech as their first language. There were 9,630 households out of which 34.40% had children under the age of 18 living with them, 61.40% were married couples living together, 6.80% had a female householder with no husband present, and 28.10% were non-families. 23.70% of all households were made up of individuals and 10.90% had someone living alone who was 65 years of age or older. The average household size was 2.61 and the average family size was 3.10. The county population contained 27.40% under the age of 18, 7.50% from 18 to 24, 27.80% from 25 to 44, 23.20% from 45 to 64, and 14.10% who were 65 years of age or older. The median age was 37 years. For every 100 females there were 100.30 males. For every 100 females age 18 and over, there were 99.70 males. The median income for a household in the county was $45,933, and the median income for a family was $53,000. Males had a median income of $34,196 versus $24,214 for females. The per capita income for the county was $20,151. About 4.80% of families and 6.90% of the population were below the poverty line, including 7.50% of those under age 18 and 10.40% of those age 65 or over. Le Sueur County usually vote Republican. In 78% of national elections since 1980, the county selected the Republican Party candidate (as of 2016). Wikimedia Commons has media related to Le Sueur County, Minnesota. ^ Leip, David. "Atlas of US Presidential Elections". uselectionatlas.org. Retrieved September 19, 2018.